I got this error when I was trying to execute my Selenium Scripts on a remote node using a SSH connection. 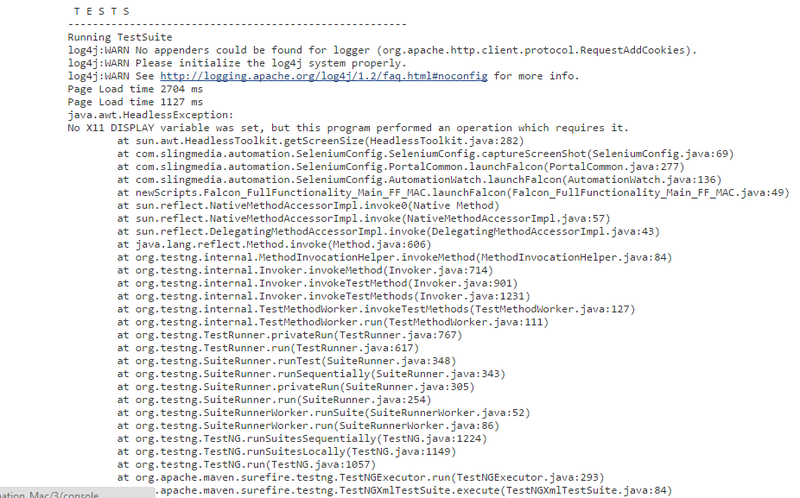 I observed this error in my stacktrace while trying to execute my Selenium script on Internet Explorer browser. 3.Give remote working directory for your node. 4.Select ‘Launch Slave Agents via Java Web Start’ in Launch Method.This is very important for machines which run Selenium Automation Scripts. 5.I have 2 dedicated nodes i.e 1 Win Machine & 1 Mac Machine for running my automation test-suite. This method is the way to go for hassle-free execution. Note:I previously tried running these scripts using SSH & as a windows service(for Win OS only) on my remote nodes , and the Automation Scripts would fail as Selenium webdrivers do not support automation processes which run as a Windows Service or a headless execution(in case of SSH). Enter the node name in the “Restrict where the project can be run” field in your Jenkins job and you are good to go!